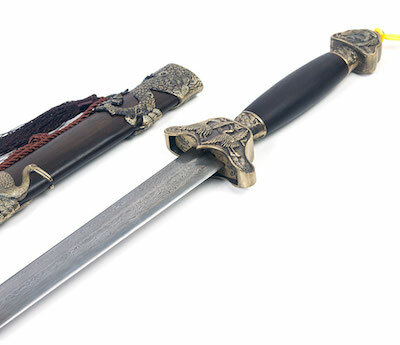 The Jian is a narrow-blade, double-edged sword, respected as the “King of Short Weapons” in China for millennia. Wielding the Jian requires the highest of skill, and the sword user must strive to the heights of spirit and morality. In addition to the obvious self-defense uses, swords were commonly carried by scholars for their elegance and beauty. The study and practice of sword techniques, like any martial art, has value that can benefit all aspects of your life. This art form has been developing for over 4,000 years and represents a great development of human culture. Sword training promotes good health. Like any sport, perfecting the art of the sword requires extensive physical training, which results in a strong, finely tuned body. Sword technique retains its personal defense value because it trains one’s perceptions and reactions, allowing for quick and correct response to any situation. Finally, the most important aspect of the art of the sword remains its moral value. The practitioner must develop their endurance, perseverance, and humility. With continued practice, Tai Chi sword will strengthen your spiritual confidence, self-respect, and power. Along with the sword form, there is a Tai Chi sword qigong form, a powerful set of exercises to improve your health and increase your stamina. According to the ancient Chinese definition, Qi is the energy existing throughout everything in the universe. Most often in modern times the word Qi is applied only to humans, and it refers to the energy circulating in your body. Qi is the life force, which enables every cell in your body to function, sometimes called ‘bioelectricity.’ Different Taiji styles may have different ways of Qigong training. No matter which style you train, the basic theory remains the same. David Silver compiled the above from several of Dr. Yang’s books and DVDs. David Silver has had a lifelong interest in meditation, and began training Gojū Ryu Karate at age 11. He studied Taijiquan, Qigong, and Yoga in his 20s, and became certified to teach Qigong by Dr. Yang, Jwing-Ming in 2006. David works as a writer, producer, and director of instructional martial arts and health books and DVDs. He is the co-writer of the books and DVDs Sunrise Tai Chi, Tai Chi Energy Patterns, and Sunset Tai Chi. David lives in Cape Cod, Mass.